I am writing you from my hotel room in Geneva, just a few hours after celebrating the best in watchmaking at the Grand Prix d'Horlogerie de Geneve. This annual awards are presented to the finest timepieces that were over the past twelve months in a range of categories from Grand Complication to Best Ladies Watch. The jury consisted of 23 people from a host of industries including designer Philippe Starck, architect Jean-Michel Wilmotte, musician (and our old pal) John Mayer, several world-class collectors such as Claude Sfeir and Viren Bhagat, several top tier journalists such as Elizabeth Doerr, Nick Foulkes, Sean Li, Carlos Alonso, and Jean-Philippe Arm, the CEO of last year's winner (TAG Heuer's Stephane Linder), Christie's international head of watches Aurel Bacs, and, well, me. 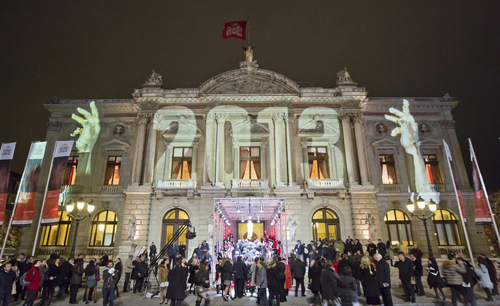 Over 1500 people were in attendance last night in Geneva's Grande Theater to see who would be awarded for their design, innovation, and creativity - including the current president of Switzerland.. There were a few surprises throughout the night, but in speaking with my fellow jury members afterwards, we believe that everyone who took home a prize last night, was indeed the right choice in all categories. The most notable prizes went to Girard-Perregaux (as we told you immediately after the award was announced) for its Constant Force LM, while A. Lange & Sohne took home two awards for its 1815 Perpetual Calendar Rattrapante (Public Prize & Grand Complication). Another notable win went to Ressence for its Type 3, an emotional favorite for many, and the special jury prize for a life-long contribution to watchmaker that went to none other than Philippe Dufour. The night was really a thrill, and I can't tell you how much I enjoyed being a part of it. It was equally thrilling to be asked to present an award on stage - the prize for best revival watch and be welcomed with such a warm reaction. You can see the video here, and see the Instagram I took while on stage here. But, without further ado, I would like to run down the complete list of winners from this year's Grand Prix d'Horlogerie de Geneva. Congratulations to all!